Based in West Sleekburn for over 30 years we are a family run scrap metal dealer. Registered and verified by Northumberland County Council and Enironment Agency we buy all ferrous and non ferrous material as well as scrap cars. and some household appliances. We also sell car parts to public and trade from the wide range of vehicles we have stored. We are a fully licenced End of Life Vehicle Authorised Treatment Facility and can dispose of your scrap vehicle legally and safely., verifying all the necessary documents. We also deal with larger quantities from industrial sources so call us for advice on your needs and a quote. Scrap metal laws require all weighed in payments to be made in cheque and that valid Identification is shown, Please remember to bring your photocard Driving Licence when weighing in. .
Cars become scrap for all sorts of reasons. 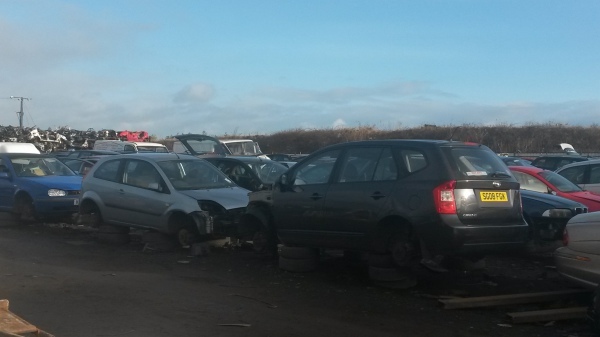 If you need to scrap your car bring it to us or give us a call for a collection, we'll help you fill in the log book details and if for some reason you don't want the car to be re sold we'll issue a Certificate of Destruction. We store a wide variety of cars available for spares and parts, as well as tyres.call if you need some replacement parts. As a certified waste carrier we can deal with clearances of industrial units,demolition sites, garages or even just garden sheds. We will bring our team and take away the metal based goods getting in your way..
We have items for sale including full cars, tyres, bric a brac, car parts, office equipment and furniture. Most items for sale will be advertised on our facebook page. Or come down for a browse. We also sell through Ebay and Gumtree and can accept payment for items via Pay Pal for your convenience. When you bring your waste metals to us we will help you unload them and get each type weighed, our friendly office staff will process your weigh ticket and issue your cheque payment, all you need to do is ensure you have your photocard driving licence or a valid passport and current utility bill. We then process your scrap and take it away to be recycled. We can help you locate the car parts you need using our computer log system which allows us to store the location of cars within our yard and check which major parts remain on them ensuring we can offer the best advice for your queries..